Athletic Influences in fashion has grown in popularity over the past few years and with sneakers becoming perhaps the most wearable trend we’ve seen in seasons, it has some serious staying power! For today’s feature, I got together with an amazing crew from New Balance: Tyler Harder, Jordan Westad and Tyler Baiby along with the adorable Mia Brissette and the multi-talented photographer Erin Crooks to integrate Street- Fashion & Athletic- Fashion looks to show that yes, sneakers are totally appropriate outside of the gym and those New Balance kicks can most definitely work with your every day style! I had the privilege of talking further with Tyler Babiy, The New Balance store Manager, to get some insight on the history & evolution of New Balance, industry innovations and his take on the fusion of fitness & fashion. Can you share a little of your background and the background of the New Balance Store? I was born and raised in Saskatoon, North End baby! I did Art College in Calgary and my Fashion Degree in Montreal. I have been back in Saskatoon for 5 over years now. I opened New Balance Saskatoon for Brian Michasiw, owner of Brainsport, on November 14, 2014. The New Balance Store is a partnership with New Balance Global. So we get the best of both worlds, over 100 years of awesome shoe making with New Balance and a rich 25 year history of shoe fitting with Brian’s vast experience in the local market. The New Balance store is definitely an experience. What is the New Balance Brand 'look and feel' in your opinion? The look and feel of the brand is always changing. At its core there is a passion for innovation. Right now you are going to see a lot of bright colors and new technology like our Fresh Foam. Something that gets me pumped is the age of our customers, it’s tough to tell who is the daughter or the mother anymore. Lots of people are really rocking some solid looks, regardless of their age. I think the game has changed on that level and it’s quite refreshing to see. Year one we just wanted to shoot things out of a canon and have a party. We did drag, zombies, giant dancing shoes… you name it. Everything we do we want to inspire people and make an impact. It’s not enough for us to just be silly, funny or quirky. We also want people to know that we are community minded, educated and that we care about our customers. For example: it’s the reason we have worked closely with our NB Ambassadors from Empire Parkour, Tyler Harder and Jordan Westad. to help them grow and let our city share in their talents. It’s hugely important for us to be part of how people use our products.We feel passionately about supporting local athletes to achieve their goals, especially when their goals are in such perfect alignment with ours. NB Run Crew & NB GO! What is this all about?! NB Go is our dynamic workout club where we partner with all kinds of fitness professionals, studios and gym around the city. Every time it is different so you never know what you are going to get. The only thing that stays consistent is that it’s always free and open to all levels. We post these unique events on our social media frequently. NB Run Crew is our seasonal running group. It was something we wanted to experiment with this year. We wanted to try a slightly different formula for most traditional running clubs. Our goal was to run at one pace with the entire group, keeping it super chill and more about the social aspect. NB Run Crew meets at the store every Thursday night at 7pm until June 9th. What are the biggest innovation trends you are seeing for the 2016 year? What’s really cool is the evolution of the concept of active lifestyle. It’s great to see products designed for people who need pieces that translate from casual to performance. A lot of buying meetings we went to, we found it hard to tell the difference between athletic shoes and lifestyle shoes. The line has become so blurred, but I think that’s just how people live now. People commute to work on bikes, they go out after a workout. This creates a need for clothing that can work in many situations. Whether you pair your fresh New Balance kicks with your favorite denim jeans and a button up, or simply your summer crop top and a skirt; they make one of the most functional accessories you can purchase! Now, not everyone can wear their sneakers to work, but, any tips for the 2016 Fitness Fashionista’s when it comes to mixing fitness gear and street-fashion? For me, it’s about personality. Each of our lifestyle shoes is so unique when we pull them out of the box, but we really don’t know what their vibe is until someone tries them on. That’s when we see how the shoe works or doesn’t. It’s always fun to see someone try on the wildest unexpected pair of classics and see what fits. JUST LIKE THE PERFECT OUTFIT CAN GIVE YOU THE CONFIDENCE OF A LION(OR TIGER OR CHEETAH…YOU CHOOSE THE SPIRIT ANIMAL ;) HOW CAN THE PERFECT SHOE DO THE SAME? 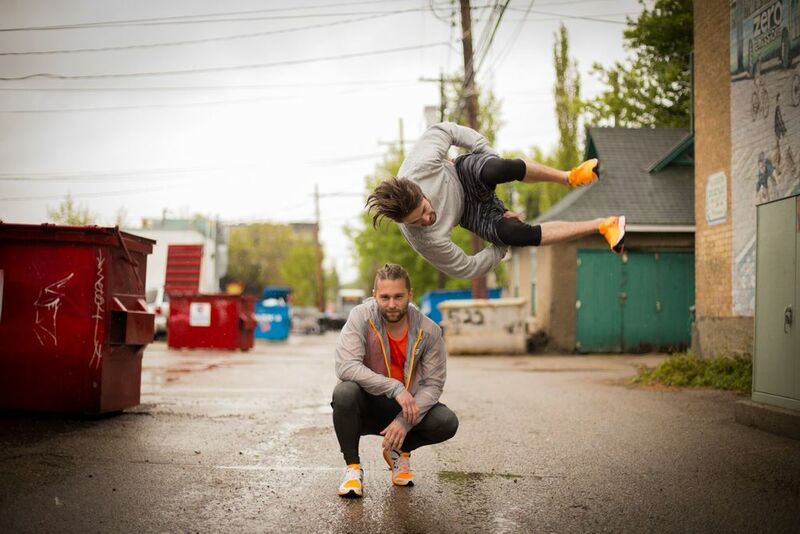 Of course looking good is important, but feeling good with footwear is huge for us at New Balance Saskatoon. The perfect shoe is one that feels like it was made for your foot. Yes we have all suffered for fashion on occasion but with our feet it’s kind of a big deal when they hurt. The perfect shoe is one that mirrors the shape of your foot and supports it in a way that is effortless. How did New Balance Saskatoon get to where it is today & what's next!? The biggest thing has been listening. We talk to our customers every day and are always adapting. It’s important for us to have a point of view and know what we are about. It’s been a learning curve from day one to figure out our unique voice in Saskatoon and as part of a global company. Today we are strong in our vision for how we want to connect with our community and we have planned meaningful ways to achieve our goals. The experience of the brand doesn’t stop at the door for us. We care about how our product performances and the impact it has on our customer’s lives. We don’t have a rule book that tells us what to do next. What we do have is a sense of playfulness, some crazy ideas and a commitment to messing up once in awhile. I personally am so thrilled that 'Street - Fashion' & 'Athletic - Fashion' have become seamlessly integrated! Fitting as many tasks into a day as possible is common for most of us, so, to be able to get multiple looks from a few key pieces is essential in being a modern day, do it all, fashionista superhero! A huge thank you to Visions Salon & Spa Saskatoon, especially Shawna Fairbairn and Paige Vos for the beautiful hair and make-up! For Tyler's killer braid, thank you Marissa Banadyga from Revamp Salon Company. Also, thank you White Dhalia for providing key fashion pieces for the shoot! Again, to the New Balance guys: Tyler Harder, Tyler Baiby and Jordan Westad as well as Mia for battling the rainy day and Erin Crooks, cannot thank you enough for the amazing photographs (we don't even look that cold)! 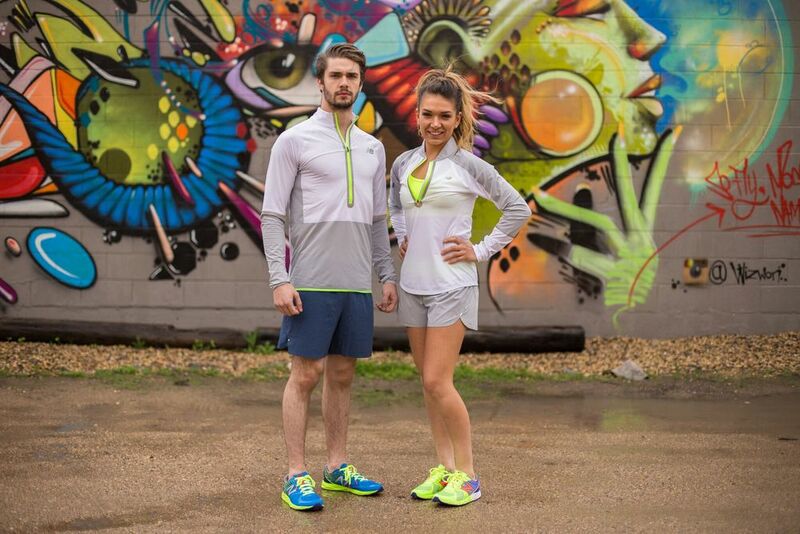 In The Running – Head down to the New Balance Store or Newblance.ca to find your next functional outfit must have! Find them on FB, IG or Twitter!